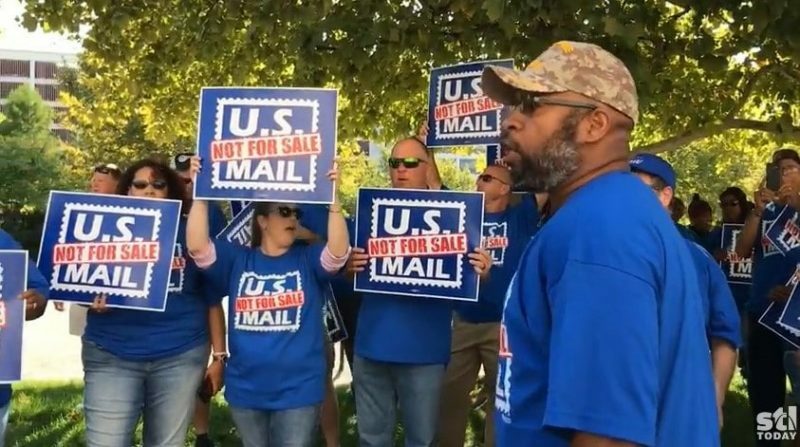 Yesterday, Oct. 8, thousands of postal workers and supporters participated in over a hundred rallies across the country to proclaim that the U.S. Mail Is Not For Sale! This National Day of Action was sponsored jointly by the four postal unions. Dozens of news outlets reported on their local events, and the hashtags #USMailNotForSale and #NotForSale tagged countless pictures and videos posted online. Click here to see the images the APWU National has received of postal workers out in the streets on Oct. 8. If you participated in the National Day of Action and there are not any photos from your event, please email images to communications@apwu.org. This entry was posted in Downsizing USPS, General Union Business, Postal Reform and Politics and tagged #NotForSale, #USMailNotForSale, APWU activists, APWU Web News Article, fighting privatization, four postal unions, march, National Day Of Action, protest, rally, U.S. Mail Is Not for Sale. Bookmark the permalink.